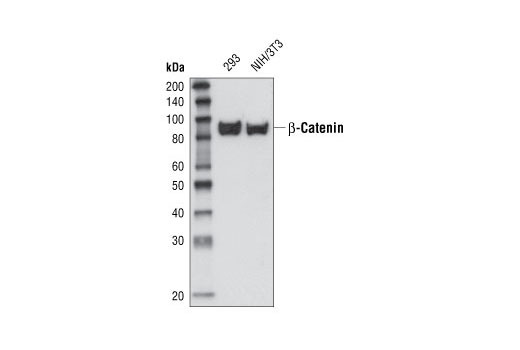 Western blot analysis of total cell extracts from 293 and NIH/3T3 cells using β-Catenin Antibody (Carboxy-terminal Antigen). Immunohistochemical analysis of paraffin-embedded human lung carcinoma, using β-Catenin Antibody (Carboxy-terminal Antigen). Immunohistochemical analysis of paraffin-embedded human clear cell carcinoma, using β-Catenin Antibody (Carboxy-terminal Antigen). 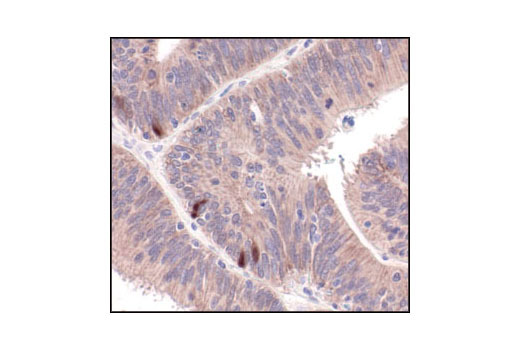 Immunohistochemical analysis of paraffin-embedded human colon carcinoma using β-Catenin Antibody (Carboxy-terminal Antigen). 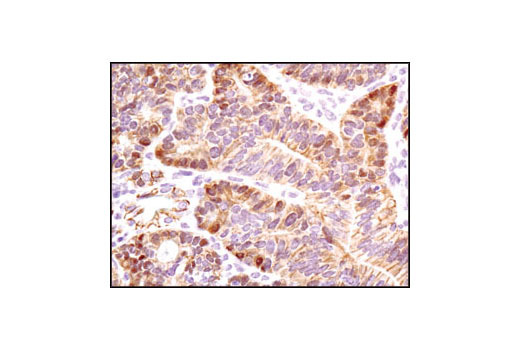 Immunohistochemical analysis of paraffin-embedded Apc (Min/+) mouse intestinal adenoma using β-Catenin Antibody (Carboxy-terminal Antigen). 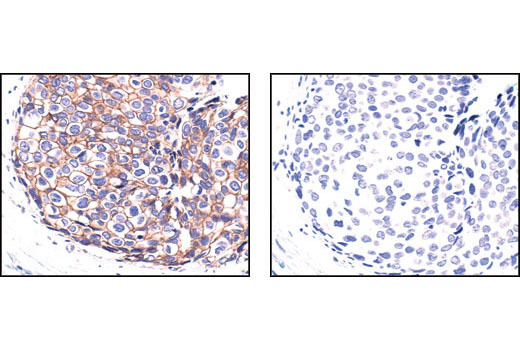 Immunohistochemical analysis of paraffin-embedded human breast carcinoma, using β-Catenin Antibody (Carboxy-terminal Antigen) in the presence of control peptide (left) or beta-Catenin blocking peptide #1002 (right). 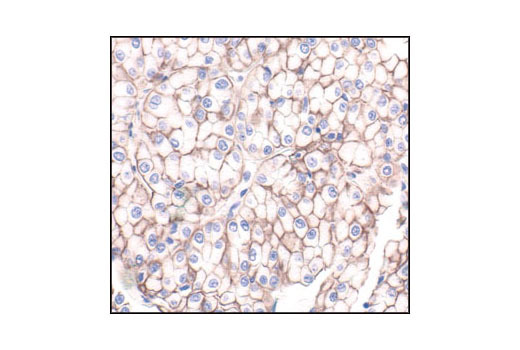 Immunohistochemical analysis of frozen HCC827 xenograft using beta-Catenin Antibody (Carboxy-terminal Antigen). 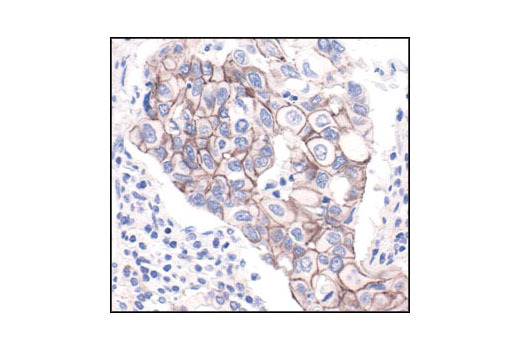 Chromatin immunoprecipitations were performed with cross-linked chromatin from HCT116 cells and either β-Catenin Antibody (Carboxy-terminal Antigen) or Normal Rabbit IgG #2729 using SimpleChIP® Enzymatic Chromatin IP Kit (Magnetic Beads) #9003. The enriched DNA was quantified by real-time PCR using using SimpleChIP® Human Axin2 Intron 1 Primers #8973, SimpleChIP® Human CaMK2D Intron 3 Primers #5111, human c-Myc promoter primers and SimpleChIP® Human α Satellite Repeat Primers #4486. The amount of immunoprecipitated DNA in each sample is represented as signal relative to the total amount of input chromatin, which is equivalent to one. Ethanol (anhydrous denatured, histological grade 100% and 95%). To prepare, add 18.75 ml 16% formaldehyde to 81.25 ml 1X PBS. For tissue stored at -80°C: Remove from freezer and equilibrate at -20°C for approximately 15 min before attempting to section. This may prevent cracking of the block when sectioning. Section tissue at a range of 6–8 µm and place on positively charged slides. Allow sections to air dry on bench for a few min before fixing (this helps sections adhere to slides). Fix sections for 15 min at room temperature in 3% formaldehyde, followed by 5 min in methanol at -20°C (do not rinse in between). Proceed with staining procedure immediately (Section D). Wash sections in wash buffer two times for 5 min. Incubate for 10 min at room temperature in 3% Hydrogen Peroxide. Remove blocking solution and add 100–400 µl primary antibody diluted in recommended antibody diluent to each section. Remove antibody solution and wash sections in wash buffer three times for 5 min each. For optimal ChIP results, use 20 μl of antibody and 10 μg of chromatin (approximately 4 x 106 cells) per IP. This antibody has been validated using SimpleChIP® Enzymatic Chromatin IP Kits. 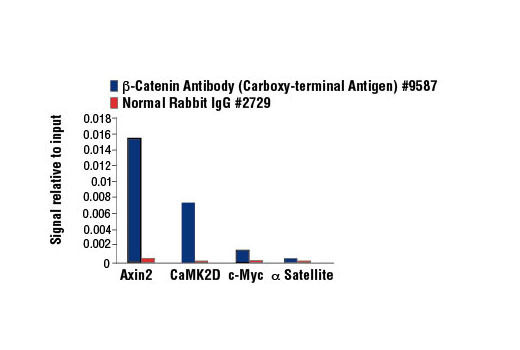 Beta-Catenin Antibody detects endogenous levels of total β-catenin protein. Polyclonal antibodies are produced by immunizing animals with a synthetic peptide corresponding to the carboxy-terminus of human β-catenin. Antibodies are purified by protein A and peptide affinity chromatography.